The 5400ACS is an integrated announcement controller with built-in message server capability that is the core of an EN54-16 compliance life/safety emergency notification system. 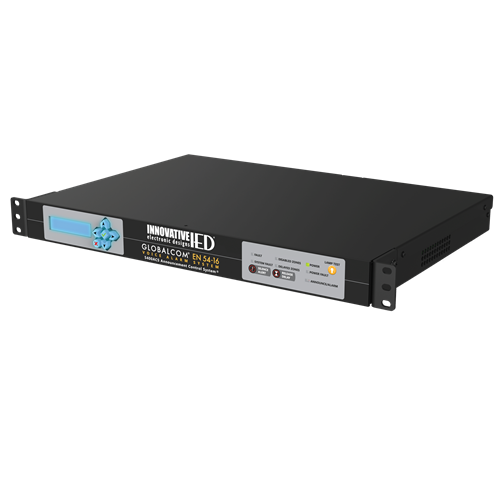 These units contain all of the intelligence to manage an entire system of emergency communication stations, digital zone manager amplifier units, and other network peripherals. The 5400ACS manages the system in compliance with the EN54-16 standard, performing overall supervision and reporting of equipment faults plus any ongoing alarm conditions. The 5400ACS is capable of interfacing with GLOBALCOM® 1100ACS/1200ACS units when additional non-emergency features or additional peripherals are required in an installation. Can handle dynamic requests for live pages, delayed pages, Digital Record and Playback (DRP), prerecorded messages (simple and assembled), and mute actions. Internal message server capable of recording 2 channels of delayed messages while providing 2 channels of message playback; all occur simultaneously in addition to as many live pages that can be supported by Dante on the network. Manages disabled and delayed zones. 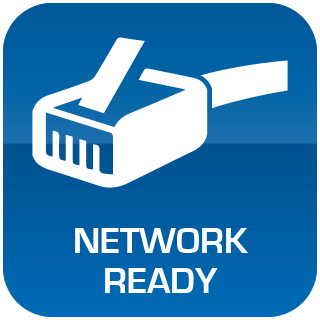 Network audio using Dante™ (High Quality Audio over Ethernet). Announcements can be initiated by contact closures, from a microphone paging station, from the 5400ACS front panel, or by a network command from higher level management software such as IED Director. Messages can be played based on schedules. Fully monitors and supervises all components of the system. Fully customizable and programmable via software tools. Provides 8 optically isolated logic inputs for external interfaces including supervision of logic links. Provides 4 Form C relay outputs for external interfaces. Multiple controllers can be used together to create larger systems. Provides two analog audio inputs for such sources as background music or fire panel audio. Provides two analog audio outputs for audio monitor or zone outputs. 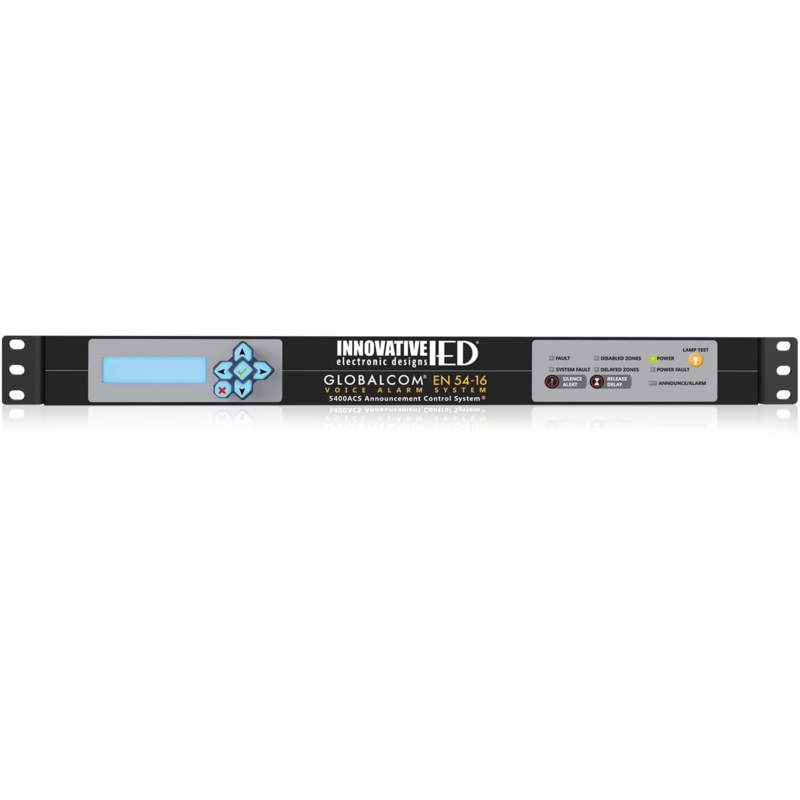 Manages up to 50 digital microphone stations (5416CS H/G or 5450CS H/G Series) on one 5400ACS. Supervises all associated devices and provides fault status information. Overall Form C fault relay provided. Works seamlessly with IED5400LL Lifeline Controllers providing hot-standby and individual fail-over support. Interfacing DZMs can allow management for up to 1024 individual zones.(5404DZM/5432DZM). Delayed messages limited only by disk space. Capable of 2 playback and 2 recording operations simultaneously. Low-power processor for high reliability and long life with minimal cooling requirements. Storage is on solid state drive for higher performance and reliability than rotating media drives. Powered from 12-24 VDC power input, such as an EN54-4 power supply. Fits into one (1) RU of 19” rack space.